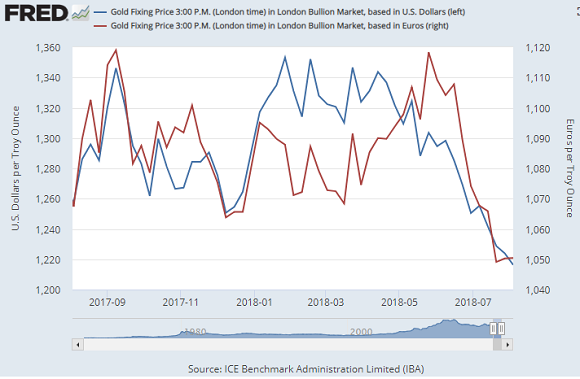 GOLD PRICES lost early gains on Monday in London as the US Dollar firmed following further escalations of the US-China trade conflict and re-imposed sanctions on Iran, writes Steffen Grosshauser at BullionVault. Gold bullion slipped to $1207 per ounce in wholesale trade but held above July 2017’s low at $1204, the level reached again on Friday before prices rebounded following news of slowing US jobs growth. Dollar gold prices have now fallen in 12 of the last 16 weeks, matching the metal’s worst runs since the start of 1994. Priced in the Euro, in contrast, gold prices have now held at €1050 for 3 weeks running. “Gold is still very much being influenced by how the Dollar is moving,” says Singapore-listed bank OCBC’s analyst Barnabas Gan. “There is a risk in the short term for a dip below $1200 if the current market dynamics persist,” agrees Marcus Garvey, commodities strategist at Chinese-based ICBC Standard Bank. The US Fed’s two remaining rate hikes pencilled in for 2018 “are already, if not fully priced, fairly nearly,” Garvey thinks. “It still feels like a test of the psychological $1200 level may be on the cards in the near future,” writes the Asian trading team at Swiss refiners MKS Pamp. 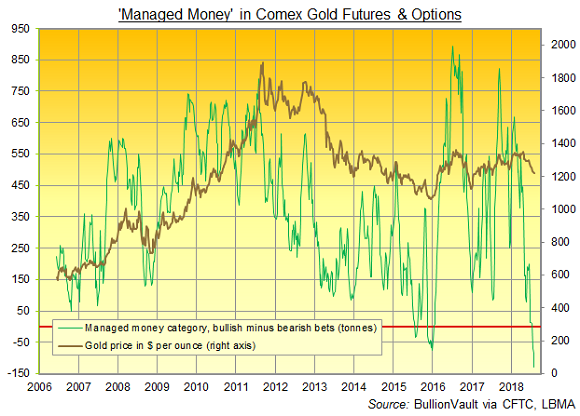 Latest data from US regulators say that hedge funds and other large speculators grew their net bearish position on Comex gold futures and options to a new series record last week, equal to a notional weight of 127 tonnes. That ‘Managed Money’ position has been net bearish in only 15 of the 634 weeks since the CFTC began collecting these figures. The average position among money managers has since early 2006 equated to a bullish bet worth 377 tonnes. Silver followed gold prices on Monday and fell after an initial rally to slip through $15.30, down over 10 cents from last week’s close as China’s stock market fell for the 8th session of the last nine. Platinum also retreated again after spiking last week following news that No.2 producer Impala (JSE:IMP) wants to cut output and headcount in a bid to lower costs below current market prices. Impala’s problems are “self-manufactured” claimed South Africa’s mining minister Gwede Mantashe on Friday after its executives apparently failed to join a meeting of 35 other CEOs with government officials to discuss “the future” of the sector. The Chinese government meantime said it would be ready for a “protracted trade war”, proposing retaliatory tariffs on US goods worth $60 billion in response to threats by US President Trump’s government to impose a 25% tariff on $200 billion worth of Chinese imports. Trump said on Saturday that “playing hardball” on trade is “his thing”. The Chinese state media responded by accusing Trump of a “deceitful drama of extortion and intimidation”. After the Chinese Yuan fell to a 14-month low on Friday, the People’s Bank of China intervened in a move to stabilize its currency, making it harder for domestic traders to bet against the CNY on the forex market. The White House also moved Monday against the government of Iran, re-imposing a wave of sanctions lifted under a historic nuclear agreement signed by Trump’s predecessor Barrack Obama in 2015. Private gold buying in Iran tripled in this year’s second quarter according to data published last week by the mining-backed World Gold Council, rising despite local prices reaching 4-year highs on the collapse of the Rial. “Iran’s weakening economy, growing sense of insecurity and a currency which has almost halved in value, boosted bar and coin demand,” said the report.